The new Bulgari factory in Valenza, Italy, is the largest jewelry factory in Europe. Courtesy Bulgari. Italian jewelry making has been bringing the bling since the 6th century BC, when the Etruscans (influenced by the Egyptian and Mycenaean civilizations) started a long tradition of quality craftsmanship in the country. Today, Italy is one of the leading producers and exporters of jewelry around the world. This staying power is in part due to the powerhouse Italian fine-jewelry and watch maker Bulgari, a company that honors Italy’s prestigious history while looking toward the future. Bulgari’s new factory in Valenza, Italy, embodies this unique mix of tradition and state-of-the-art technology. Valenza was a sleepy little village before goldsmith Francesco Caramora set up shop there around 1817. Caramora brought and shared his special skill set, which transformed Valenza into the world’s most famous “city of gold” at that time. It is the former site of Caramora’s workshop—a farmhouse called the Cascina dell’Orefice, or the “Goldsmith’s Farm,” on the village’s outskirts—that Bulgari handpicked for its new facility. 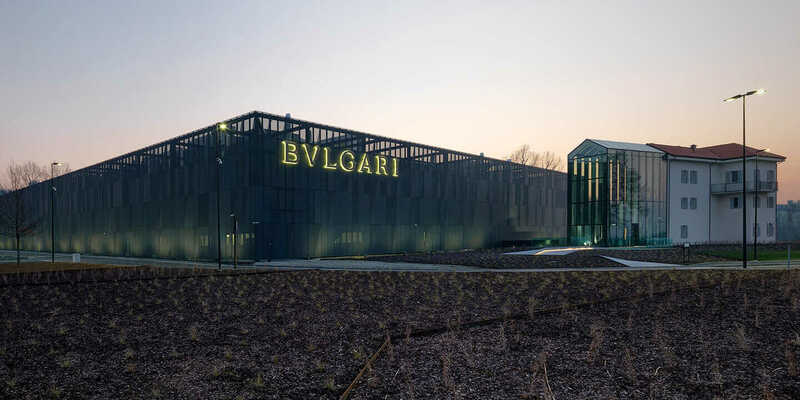 With the help of Bologna-based architecture firm Open Project, Bulgari has restored, remodeled, and extended Goldsmith’s Farm into a modern, avant-garde facility that contains all of the company’s operations. A sleek glass-and-steel structure forms the administrative and hospitality hubs, and the factory comprises a three-story building with a 600-square-meter interior courtyard. The entire facility spans more than 14,000 square meters, making it the largest jewelry-making factory in Europe—and one of the most sustainable, demonstrated by its LEED Gold Certification. Open Project had to consider many unique elements to make a factory like this functional. 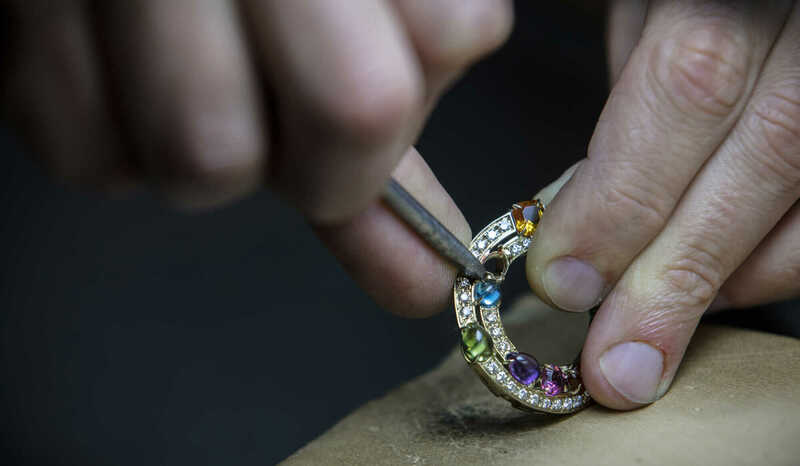 In addition to preserving the site’s cultural significance and meeting the high aesthetic standards of a client such as Bulgari, the firm also had to address the technical requirements of fine-jewelry production and its rigorous security needs. “This is a jewelry-manufacturing facility, so, of course, security was paramount,” says Luca Drago, a partner at Open Project. See how BIM brought the Bulgari factory to life. The skin of the building is the first layer of the onion and serves several purposes. It is a system of aluminum panels, set six feet from the exterior wall of the facility, that act as a “first line of defense visually, because it stops you from seeing into the building,” Drago says. But this aluminum skin is more than just a visual barrier; it’s part of what makes the facility an architectural gem. The aluminum panels are coated with an electrolytic coloring treatment that changes as sun moves during the day. The panels’ textures vary, and holes change in size and placement to create an opaque barrier that does not, miraculously, obstruct the view from inside—where “the metallic skin seems to turn into a light curtain” that immerses the craftsmen in the surrounding countryside, according to Bulgari. The high security of the facility dictates that employees must stay on campus during the entire workday. Once again, Open Project used the architecture of the building to address this issue, designing a huge interior courtyard in the factory building that not only brings natural light to the interior parts of the workspace but also serves as a gathering space for employee breaks during the day. In addition to the security puzzle, Open Project had to create a multidisciplinary design process for the facility’s rigorous technical requirements. “We set out to optimize the manufacturing process, and this had to be coordinated within the constraints imposed by the prefabricated structural components and the forest of mechanical, electrical, hydraulic, and special plant systems required for processing precious metals,” Drago says. The factory is made up of 18 workshops known as “islands” grouped by product families. Every “island” houses all that’s needed to make a particular product, including the jewelry makers, stone setters, and polishers. This layout makes for 200 jeweler workstations, each connected to its own processing system. This complex setup made effective coordination with structural, mechanical, electrical, and plumbing (MEP) engineers vital to the project. By using the latest technology in building design, security, and manufacturing processes, Bulgari has created a factory worthy of its luxury brand. And with a new school that trains up-and-coming jewelry makers within the Valenza facility, Bulgari is solidifying its foothold in the tradition of Italian jewelry making—now in an architecturally beautiful facility that’s also a pleasant place to work.